Allergies develop when the immune system reacts abnormally to a trigger that is typically harmless to others, provoking varied reactions. During allergic reactions, chemicals called histamines are released that cause inflammation and other symptoms. Antihistamines are often prescribed to stop allergy symptoms, but sometimes they bring undesirable side effects, such as drowsiness. Allergic rhinitis, or hay fever, is usually caused by airborne mold and pollen. It is typically considered as a seasonal allergy, but it can become perennial due to daily contact with dust, pet hair, dander, and more. Constant inflammation of the sinus cavities can lead to a sinus infection, also known as sinusitis, which can develop into chronic condition. Symptoms for both include headache or facial pain, stuffy or runny nose, itchy eyes, sneezing, and general fatigue. Aside from allergic rhinitis and sinusitis, other allergies can also result in bumps, itching, and redness of the skin from rashes, hives, or eczema. The causes of these symptoms are often difficult to identify, as they can arise from contact with plants, certain compounds in food and medication, and many other less-obvious triggers. ALLERGIC RHINITIS, ALSO KNOWN AS HAY FEVER, IS A CONDITION THAT AFFECTS BETWEEN 40 AND 60 MILLION AMERICANS. Some herbs work naturally by protecting cells from histamines instead of blocking the body from producing them. 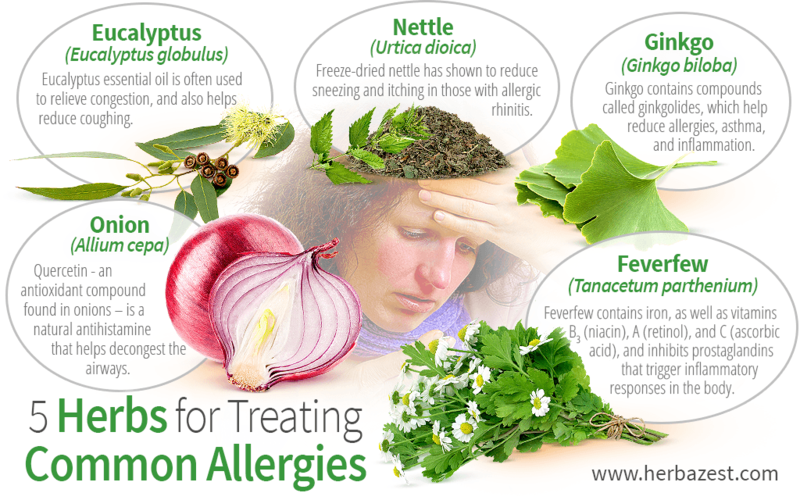 Check out these five herbs that have proven effective as alternative treatments for common allergies. Ginkgo has a significant effect on controlling allergies and improving respiratory function due to its dozen different anti-inflammatory compounds and seven natural antihistamines. The herb also contains compounds called ginkgolides, which help reduce allergies, asthma, and inflammation by blocking a protein that provokes asthmatic bronchial spasms. Nearly everyone has had the experience of crying from a chopped onion. This reaction can also help clear sinuses that are perturbed by allergies. In addition, quercetin - an antioxidant compound found in onions, among other foods - has antihistamine properties, helping decongest the airways. Eucalyptus is a decongestant and works well for blocked sinuses, from hay fever to sinusitis to other obstructive respiratory conditions. Its anti-inflammatory, mucolytic, and bronchodilating properties are largely due to its active ingredient, the antibacterial cineole. Eucalyptus essential oil (alone or mixed with other essential oils) is often used to relieve congestion, and eucalyptus aromatherapy help reduce coughing. Brew a hot jasmine and eucalyptus tea for respiratory relief, as well as a eucalyptus and linden infusion for bronchitis relief. Feverfew has been noted for its anti-inflammatory and anti-allergic effects throughout the years. The herb contains vitamin B3 (niacin), iron, vitamin A, and C (ascorbic acid) and inhibits the formation of prostaglandins in the body, which are natural chemicals that play a role in inflammation. It has also been found to restrain the release of serotonin from forming platelets, preventing migraines. Stinging nettle has primarily been associated with irritation when the plant is touched due to fine hairs on the leaves and stems that contain irritating chemicals. However, in human studies, freeze-dried nettle was found to reduce sneezing and itching in those with allergic rhinitis, with almost half of participants claiming the herb was more effective than allergy medications previously used. Since allergies have evolved to become such a common problem, there are many more herbs and herbal remedies that can help relieve symptoms without pharmaceutical side effects, when used properly.